Luke gives us a picture of the world which most of us will not recognise. It is not the poor who are blessed surely, it is the rich, that is why we want to buy lottery tickets. Mourning follows death and even Jesus cried at the funeral of his friend Lazarus. What is uplifting about grief, loss, parting from those we love by the finality of death, there is a reason why we call him the 'Grim' Reaper not the 'Happy' Reaper. Jesus is not surely claining to have found that in some way he can turn sorrow into laughter, so what is going on? Well we know Jesus wanted to reverse death, he wanted the hungry poor ones to be fed. Everybody had a right to pray for their daily bread. Jesus is showing where the sympathies of God lie. Not with those with full tummies who sleep soundly while their neighbour is in need. Jesus went about addressing the wants and needs around him to show that God was on the side of those who had nobody to fight for them. It is all a far cry from the thinking of the time that God gave much to his special ones. To be on God's side meant the winning side, the man who followed God would be like a tree getting all the water. Jesus sees it is not always like that, sometimes the ones who receive all the good things do things by trampling over the needs of others. Jesus wants to show a new way, God's real way, it is better to give than to get. It is all a part of his reversal of the standards of the world, turning our expectations inside out. Merciful Father, who gave Jesus Christ to be for us the bread of life, that those who come to him should never hunger: draw us to the Lord in faith and love, that we may eat and drink with him at his table in the kingdom, where he is alive and reigns, now and for ever. In the Monty Python movie "Life of Brian" Jesus goes up on the mountain side to teach the people. There is a huge crowd gathered around him - so huge that some of the people who are on the outer edge of the crowd cannot hear his words and must ask others what the master has said. As Jesus pronounces what have become known as the beatitudes - one of the characters in the movie - desperate to know what Jesus is saying asks a man who is ahead of him the crowd — "what is he saying - what is he saying?" The man checks with a person in front of him, who in turn checks with someone else and then the message is relayed back—the Master says - "Blessed Are The Cheese Makers." This is perhaps just a reminder to us of how often we get wrong what Jesus has said. and as a way of making us think about who is blessed and who is not. Who are the blessed ones anyway? Who is it that God favours? And who is that God looks askance at? Who is it that God warns - that God threatens - with troubles and woes? If you listen to the preachers on cable TV and in some churches the answer seems clear. Those who succeed in life are the ones that God favours: - Those who have money in their pockets, smiles on their faces, well behaved children and who do not get sick without a miraculous healing next week in church. These are the blessed - while those who struggle with depression and despair, - those who live in poverty who perform menial tasks each day - those who serve others rather than living as their equals - and whose children are an embarrassment - these are the cursed and the afflicted. But is it true? Is this what Jesus taught? The author of the third gospel - the Physician we know as Luke - clearly thought a great deal about whom God blesses and whom God does not. I say that because Luke's account of what we call the Sermon on The Mount is different than Matthew's version. Luke gives us a different view of Jesus' sermon, and in some ways a clearer view. First - in Luke - the sermon is not set on a hillside - where Jesus can look over the top of the crowd and hand down the word from on high to those who are beneath him. Rather it is set on a plain - on a level place - where a large crowd has gathered and pressed in upon him - and where Jesus has been walking among them - healing their diseases and curing their afflictions. And secondly in Luke Jesus announces a series of matching curses or woes: Blessed are you who are poor, for yours is the kingdom of God - woe to you who are rich, for you have received your consolation. Blessed are you who are hungry now, for you will be filled - woe to you are full now, for you will be hungry. Blessed are you who weep now, for you will laugh - woe to you who are laughing now, for you will mourn and weep. Blessed are you when people hate you and when they exclude you, revile you, and defame you on the account of the Son of Man, - woe to you when all speak well of you, for that is what their ancestors did to the false prophets." Think about it. What does this list say about our aspirations? About our dreams? About our rushing out to buy lottery tickets so that we might win the big one? Almighty God, who alone can bring order to the unruly wills and passions of sinful humanity: give your people grace so to love what you command and to desire what you promise, that, among the many changes of this world, our hearts may surely there be fixed where true joys are to be found; through Jesus Christ your Son our Lord, who is alive and reigns with you, in the unity of the Holy Spirit, one God, now and for ever. Loving God, like Peter and Andrew, and James and John, we sometimes feel discouraged - we work hard at what we do - work hard and yet sometimes our labour seems in vain. Help us to not be discouraged - bur rather grant that we might hear your voice and accept your direction and venture forth again in obedience to your word. Holy God - we know that you seek messengers today as you sought them in the day of Isaiah. You call us, as you called Peter and later Paul, to follow in the path of Christ Jesus and to bring to you all who are in need of you. Cleanse us, Lord, as you cleansed them, touch us with coals from your alter, lift us up from our knees where we fall before you, pour your grace out upon us -- and help us to remember that is your purpose and your power to which we bear witness - not our own. As you filled the nets of the disciples, O Lord, so we ask you to fill the nets we cast at your direction. -- grant that our prayers for healing might be answered... -- grant that our work for justice might lead to a more equitable sharing of what this world affords -- grant that our words of forgiveness might bring reconciliation -- grant that our acts of compassion might satisfy those who are in need and grant that our way of being might prompt others to praise and glorify your name. O God, you know us to be set in the midst of so many and great dangers, that by reason of the frailty of our nature we cannot always stand upright: grant to us such strength and protection as may support us in all dangers and carry us through all temptations; through Jesus Christ your Son our Lord, who is alive and reigns with you, in the unity of the Holy Spirit, one God, now and for ever. 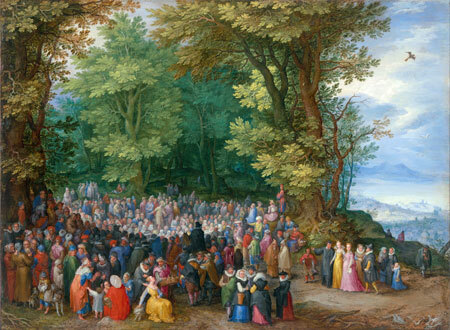 The Dutch artist Jan Brueghel painted this picture on a thin sheet of copper at the time of the Reformation. A friend of Rubens these were the leading Flemish painters in the first three decades of the 17th century. This is a small painting (26.7 × 36.8 cm for such a big scene, the Sermon on the Mount, which Luke records in the reading this morning as the Sermon on the Plain. The setting is a glade in the wood on a mountain, in the distance you can see the city and the sea. This was a time when scripture was significant and sermons, like this one delivered by Jesus were important. So of course was the reaction to what was preached and Brueghel is inviting us to think about the different responses to the Word of God which like in the parable of the Sower can fall on good soil of end up on rocky ground. Look at the different people in the story who have been gathered together. The whole of society is represented, soldiers with swords, a man on a horse, young and old, rich and poor, the educated and the jester. Jesus is in the middle of the picture, identified with a halo on a makeshift stage with branches. If you look behind Jesus you will see only eleven disciples, perhaps to indicate the absence of Judas, the disciples hang on the words of their teacher. Those closer to Jesus are in stronger light and generally seem to be more interested and listening to what he says. However in the darker areas of the picture many folks do other things. Some are talking among themselves, one man sells pretzels from a basket to the woman in the yellow dress. She is patting her dog and attracting her own attention, no doubt partly due to her ample bosom a worldly distraction from the teaching of Jesus! The words of wisdom from Jesus are also falling on the deaf ears of one gentleman who has his palm read by an old gypsy just to the right of the two dogs. Are you listening to Jesus, is your attention elsewhere or are you seeking guidance in darker places? Luke reports people coming from large distances to see Jesus. Jesus instructs the people and heals them and they become aware of God’s power through Jesus words and actions. At a stage in the Gospel when opposition from religious leaders is rising, Jesus is represented as a charismatic teacher who speaks and acts with divine authority. It is this Jesus who addresses his followers, both those present and the wider group of Luke’s readers then and now. Mirroring the Sermon on the Mount (Matthew 5-7), Jesus teaches in what could be described as the “Sermon on the Plain” (vs17). The Beatitudes, a series of promised blessings, are given to those who really are poor, starving, disconsolate and despised for their faith, for God’s concern and blessing is for them. However, in contrast to Matthew, Luke does not allow any possibility of the spiritualizing of Jesus’ words: in reality, these people have little or no status, power, influence, they really are the poor, the marginalized and oppressed. The contrasting woes are a timely warning to those who enjoy a luxurious lifestyle in the present, without doing anything to help those who are suffering. 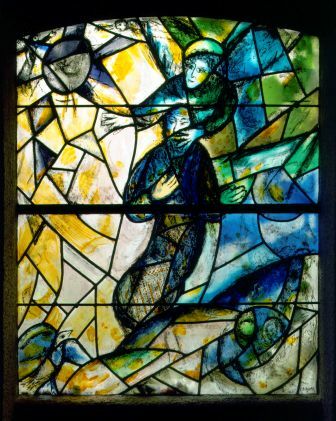 In the Gospel of Luke the theme of the values and assumptions of society being turned upside down is frequently heard. Jesus constantly challenges the ethical and moral standards of his contemporary society and this of course presents a challenge for us today as we seek to follow Jesus. The promise of blessing not only needs to be regarded as being fulfilled at some point in the future, but we must also consider that it should be made a reality in the here and now. This can only happen when the existing world order is challenged and overturned. As disciples of Christ we need to consider how we endeavour to ensure the Blessing of the Poor is realised in our society today. If it is not, then we should challenge the structures and practices which keep the poor in poverty, the marginalized on the edge of society and the persecuted in oppression. It is a challenge which we dare not neglect. Let us seek God’s guidance as we work towards a fully inclusive and integrated society, where the poor and marginalized are not just patronised with words, but are empowered to lead just and fulfilling lives. The Grail Prayer Lord Jesus, I give you my hands to do your work. I give you my feet to go your way. I give you my eyes to see as you do.I give you my tongue to speak your words. I give you my mind that you may think in me. I give you my spirit that you may pray in me. Above all, I give you my heart that you may love in me your Father and all mankind. I give you my whole self that you may grow in me, so that it is you, Lord Jesus, who live and work and pray in me.